Tell us about your free time when you were a child? What toys / games did you play, how did you play this game, what were the rules, where did you play. And did you do these alone or with friends / siblings. 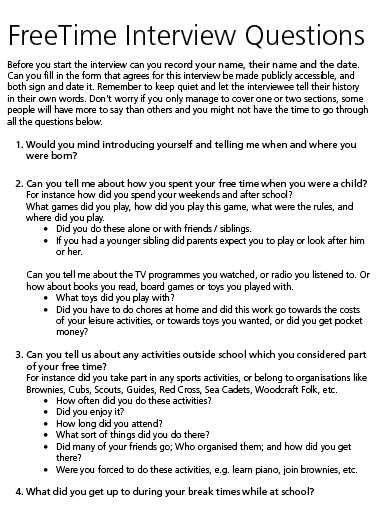 Can you tell us about any structure leisure activities you did as a child, such as scouts, guides, etc? Did you play with friends or siblings in the street, or out in the countryside without adult supervision? Can you tell us about about things you got up to in your leisure time as a teenager? Were you ever a part of a youth movement and how would you arrange to meet up? As an adult can you tell me in your own words about what you used to do for fun or relaxation in your spare time? How did you manage to fit your leisure activities in with your working life.